When preparing to make cards, I find it’s easier to make Assembly Line Cards where I make all the elements of the cards first and then do the FUN part of putting them all together at once. If I do them in sections, I can work in little snatches of time and manage some cleaning up as I finish each step. I think most of us have limited time & space and with so many tools that can be involved, I find it easier and pleasanter to work with an organized and clean space. Sometimes, when I make cards, I have the basic idea is in my head but not all the details. I like to put the pieces together a little differently, so everyone gets their own individual design. Card Making Tip: I keep a large box that I store all my card elements in. Step 1. For instance, if I am making my own bases, I will do them all at once. With the cardstock on hand in the appropriate color, I will cut 8 ½ x 11 paper in half to make A2 size cards. I will get out my scoring board and bone folder and score and fold them all first. I find the A2 cards (4 1/4" x 5 1/2") are the easiest size to make from 8 1/2 x 11 paper or cardstock, but you can also make other card sizes with larger paper like 12" x 12" scrapbook paper or cardstock. You just need to make sure you can find appropriate sized envelopes which can sometimes be tricky. And leftover scraps from the larger paper or cardstock is great for embellishments. If I am lucky enough to find my card bases pre-cut and scored, I don’t have to do this step. But I have seldom seen pre-made card blanks in anything other than white or ivory unless I am at a card makers specialty store. Card Making Tip: Whatever size I use, I like to make sure I can get the envelopes for the same size card. And, it might be a good idea to check with the post office to make sure your card size & envelope will not require extra postage. After this step is done, I can put up my scoring tools and get ready for the next step. That next step might take place right away, or next time I have some time. Step 2. My next step is to get out my stamps, ink pads, pens and maybe embossing powders or glitters to prepare for my outside and inside greetings. 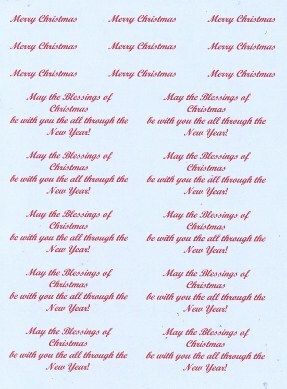 I will do my stamping of the greetings on a large piece of cardstock or paper multiple times in inks to go with my background or printed papers. Your Journaling and Greetings can also be done on the computer using one of your nice fonts and any color of your choice. Either way, the finished page would look something like the example at the right. Card Making Tip: I plan ahead here when spacing the greetings to make sure I have a die cut to fit around them. If I plan to emboss my greetings or do them in glitters, I add that step here. This way I am not trying to be accurate with the stamping on a finished card. If I mess up the stamping at this stage, it’s no big deal. While I have out my stamping tools, I might also stamp a decorative accent on the envelopes as well. I like my envelopes to match my cards in some way, and this is easy to do at this stage. For stamping on envelopes, you can do that on the back or the left edge, maybe allowing the stamp to go off the edge of the envelope. Make sure you leave room for the post office to properly process if you are planning to mail your card. Once I have stamped enough of my greetings and envelopes, I can clean up these tools. Step 3. Next time I have a few minutes, I will get out my die cutting tools and cut & emboss various shapes like circles, ovals, squares to fit around my greetings. Once those are done, I can put away my die cutting and embossing tools. Step 4, 5, 6, 7 & 8. If I am using ribbon and am going to want bows, I tie all the bows at one time. If I plan on punched shapes, my favorites are snowflakes, I will punch them out at this point. Since all snowflakes are different, I have multiple punches and dies for these. Or, I might wrap my shapes with thread if I want some Spirella Design Embellishments . Or, I might make some Bargello Scrapbook Embellishments or Iris Folding accents to go on my cards. Or, I might do Glimmer Mist or Dicrofiber Scrapbook Embellishments at this time. Each of these embellishments are an Assembly Line process as well. Step 9. Since I store each set of elements in a box with the card blanks and envelopes, I am ready to finish my cards at any time. That way, when I am ready to assemble my cards, whether one card or fifty, all of the pieces are done, and the final assembly is quick and fun. Card Making Tip: If I have any left over items, I can save them for later. I like to have leftovers handy so that when I need some nice hand made greeting cards in a hurry, I can go to the box with my card elements and usually find something to put together without having to pull out all those tools. Card Making Do Not Do List for a few things to avoid.